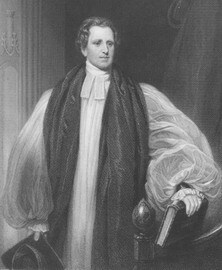 On 5 September 1832 Bishop Daniel Wilson, the Bishop of Calcutta, (shown above) consecrated the ground on which St Paul's Church stands. 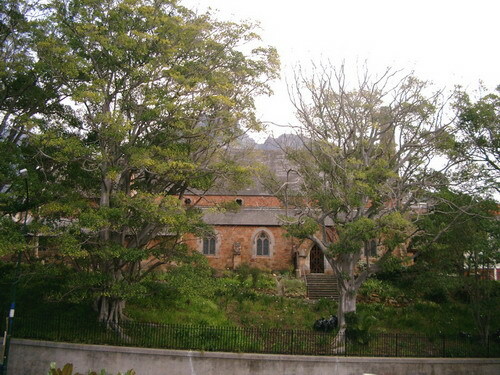 Just six days had elapsed since the Governor of the Cape, Sir Lowry Cole approved the grant of this area of nearly one-and-half hectares at the foot of Devil's Peak to the people of Rondebosch for the erection of an Anglican church. The clear-cut boundaries that define the ground today differ little from those of the original grant: straight at Church Street and curved at the Main Road. A lease was later negotiated with the City Council to enable them to encroach onto the church's property to widen the Main Road. St Paul's Church above the Main Road today. Other than a surveyed plan of the land and the prescription of the grant there are no records to show what improvements were to be made at that time. One intention seems to have been to prescribe a part as a cemetery. There are still the numerous headstones remaining on the site and the Church possess a plan showing the layout of grave plots. No burials took place after the end of the nineteenth century and although the cemetery is still exists it is in need of some preservation work. 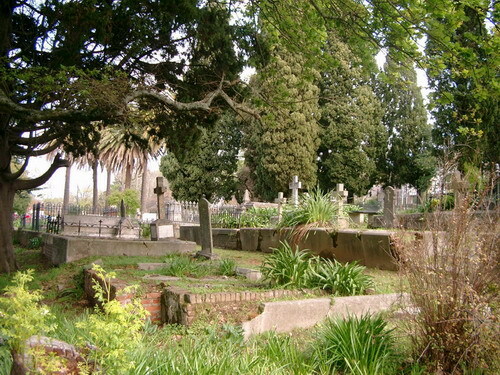 The Western Cape Branch of the SA Archaelogical Society has surveyed the graveyard and captured data concerning the graves and the gravestone inscriptions. This will shortly be available in a book. A few artists' impressions of the original church building are still in existence, one being by Michell himself and another being by Thomas Bowler, dating from 1848. These two artists show a difference in the west end gables. Michell shows a plain gable, but Bowler shows castellations. This is because a porch and the castellations were added in 1842. Later additions to the buildings also appear in sketches, water-colours and early photographs. There is a photograph taken some time between 1875 and 1880 that shows the current nave of St Paul's Church as an attachment to a less lofty small thatch-roofed building. 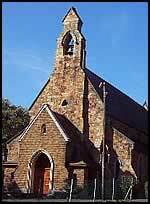 The latter corresponds well with what we know of the original church building dating from 1834. Apart from the church building, Bowler includes an isolated cottage-style building that might represent the school erected on the site during the early 1840s. This school, though not the little building, continued to function without interruption until the end of 1951. Prior to the grant of this land for a church, the site was described by a preacher at a celebration of the fifth anniversary of the opening of the church as 'a receptacle for the veriest outcasts - a scene whereon the wretched aboriginal steeped himself in all those vices which he had learned from the ungodly stranger, a place loathsome to the eye and offensive to the ear'. This seems to imply that with the building of the Church the presence of vagrants and squatters on the site had ceased. One would like to be able to say that this improvement was permanent but, alas, vagrancy continues to despoil the St Paul's grounds today. 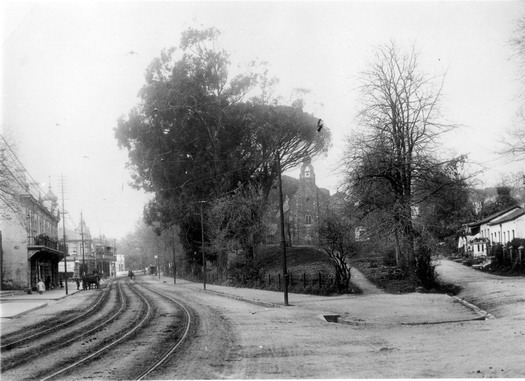 Despite the above, the property of St Paul�s, in what is now the midst of the commercial centre of Rondebosch, still serves the original purpose for which the six eminent citizens had requested the Governor�s grant of land. St Paul's Church looking up from the Main Road, post 1891.